This post is another one of my “ketchup” posts, trying to share some of my past finished projects. 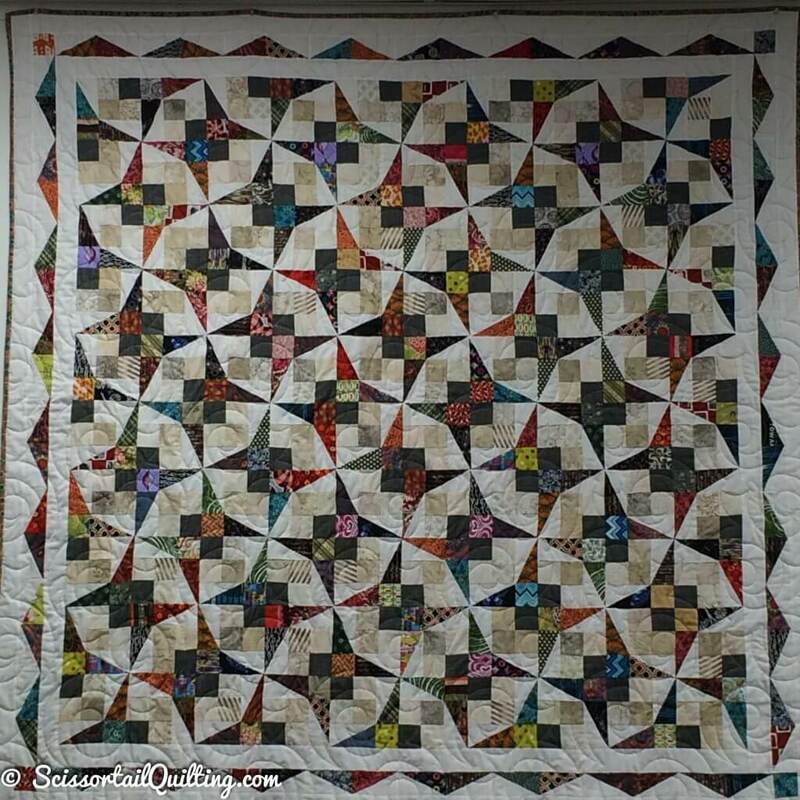 Today’s quilt share is for my Tennessee Waltz quilt. It has become one of my favorites, although at first, I wasn’t terribly excited about making it. It now holds some very fond memories for me, so I think after you read the backstory you’ll understand why I love this quilt so much. This post contains affiliate links, which means that if you click the links and choose to make a purchase, I will earn a commission. This commission comes at no additional cost to you but does help me earn enough to support the cost of this website. Please know that I only link to items which I personally use and feel that I can confidently endorse. Your support by clicking on these links is greatly appreciated. Several years ago, I made a Jen Kingwell “Flutterby” quilt for a class at a local quilt shop. This story is not about that quilt, although I will post about it soon. It’s another favorite. The pattern for this flutterby quilt can be found in Jen’s book “Quilt Lovely” which you can find on Amazon using the affiliate link below. My Flutterby quilt was hanging in the shop when my (now) friend Phyllis from Guymon Oklahoma came into the store. The focus of the class I was teaching was on how to use a specialty ruler to make the long Half Rectangle Triangle (HRT) units in the Flutterby block. The original pattern suggested using templates, and my technique greatly sped up the process. Phyllis saw the quilt and the information about the class, then asked the ladies at the shop for my phone number. Phyllis later contacted me and asked if I would be willing to travel to Guymon Oklahoma to teach the class, as Phyllis headed up the education committee for a meet-up that happens every year between her guild and another nearby guild. I was delighted to make the trip. But one thing you have to understand is that Guymon is WAY out in Western Oklahoma. Just visualize wide open spaces and an occasional tumbleweed. Since it was going to be such a long drive and I was going to have to stay overnight, Phyllis suggested that the time would be better utilized if we came up with a second quilt class that also used the specialty ruler. 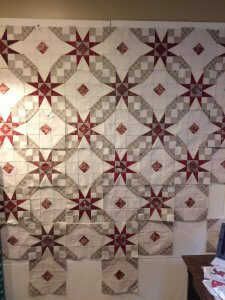 Enter the Tennessee Waltz Quilt? I had already been playing with quilt designs that used HRTs and started sending her images of quilts that I thought would make a good class. She called me a few days later and said that the committee would really like to have the second class be on the Tennessee Waltz quilt. 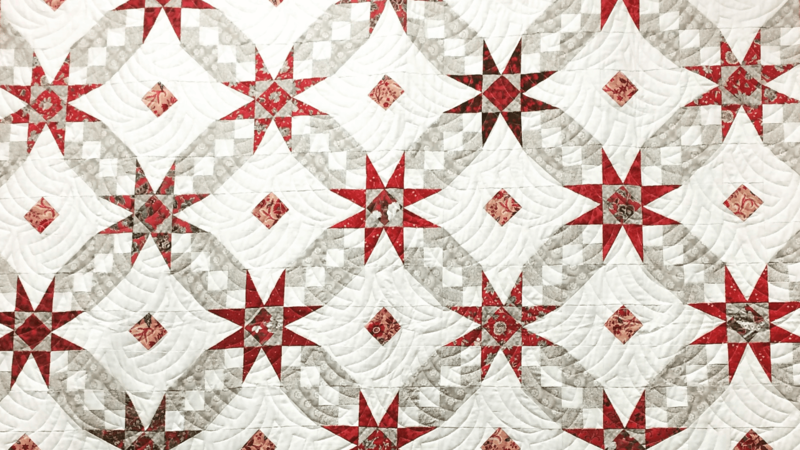 The Tennessee Waltz Quilt is a two block wonder. It is the combination of a “54-40 or Fight” block and a Snowball block. I set to work to see if I could get that ruler to work on the “V units” in the “54-40 or Fight” Block. Let me just say that it was a fight. And I was losing. I ultimately gave up and decided that foundation piecing was the way to go, as it gave the most consistently accurate results. My collection of French General Fabrics by Moda was just crying out to go in this quilt. I’m a sucker for red. As you can see, I changed the original Tennesse Waltz Quilt pattern just a bit. I’m partial to Square in a Square (SNS) block units, as I love the way they look. So, I used SNS units inside the central square of both the snowball quilt block and the 54-40 or Fight Quilt Block. In mid-April 2017 I traveled to Guymon with my quilts in tow, taught the two classes and presented my first ever trunk show. It turns out that we should have planned three classes, because (as wild as this sounds) I got snowed in and had to stay an extra night! But it all worked out…I had brought a little wool applique kit with me, and I stayed up stitching while the blizzard roared outside. So, I learned so much from this whole experience. And it would be ungrateful of me to not say how much I appreciate the ladies I met on my trip to Guymon. They were incredibly gracious to me, despite the fact that most of them had been quilting much longer than me, and several of them were Paducah Quilt show winners. To find that out in the middle of class is quite humbling. (I’m used to teaching beginners…) As a teacher, I learned to be better prepared next time for a more advanced segment of students! 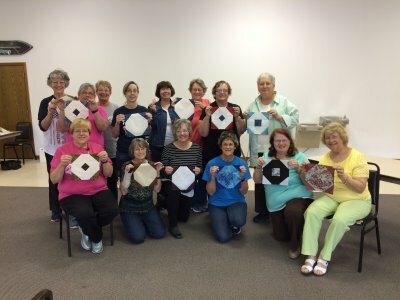 Students from the Tennessee Waltz Quilt Class with their Snowball blocks. In recent months I’ve also learned a much better way to make those “V units.” I purchased this ruler on my trip to the Houston Quilt Show, and have played around a bit with it. Let’s just say it makes quick work of those V Block units. And the really funny thing is that half of this ruler is actually an HRT ruler. I guess I wasn’t too far off the beaten path after all. The thing I was missing was that you needed to make it a bit oversized, then trim down. And this tool does a perfect job with it. 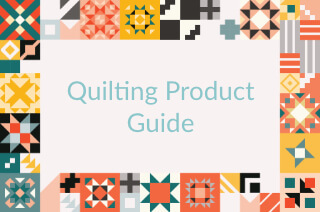 I am currently working up a “V Block Unit” entry for the Basic Units section of the Quilt Block Library and hope to have that content ready for you soon. I think what I love so much about quilting, and it’s part of what this quilt represents to me, is that we are always learning. Even as we get older. We may be “wiser” but there is always so much much that we can learn. There is always a better way, a new technique. We keep evolving. And the next quilt I make and the next class I teach will be better because of it.